This has been one of the most read articles in The Washington Post real estate section over the past few days along with a high number of shares on social media so this is clearly a hot topic for our area. What are your predictions for 2015? Will it be better or worse than 2014? David Charron, president and CEO of Rockville-based multiple-listing service MRIS, writes an occasional column about the Washington-area real estate market. Though the Washington-area real estate market ebbs and flows, 2014 was actually one of the most stable years in recent memory. All indicators suggest that this trend will continue in 2015, and that there are plenty of reasons to be optimistic. Here are five real estate storylines MRIS will be following. • Inventory: For the past few years, the lack of houses for sale has significantly impacted our local real estate market. But we’re seeing more and more signs that inventory will be on the rise in 2015. Not only have there been more new listings for most months of this year compared to the same month last year, but there is still a steady influx of new homes for sale, even as we approach what is traditionally the slowest time of the year for real estate. In fact, there were more new listings in Washington this September than any other month of the year. • Price: We anticipate a higher number of new listings next spring, in part because more houses have appreciated in value. Now that prices have risen, homeowners have regained equity in their properties and are ready to test the market. In all but one month of 2014, median sales prices were up compared to the same month of 2013. October even saw a surge, with sale prices rising 9.9 percent over October 2013. However, prices are unlikely to jump too much higher, because the increased inventory means sellers will have to compete against more listings to win over buyers. • Interest rates: At this time last year, most people in the industry predicted mortgage interest rates would rise above 5 percent in 2014. But as of this writing, they are still hovering around 4 percent and have been decreasing incrementally over the past 10 months. 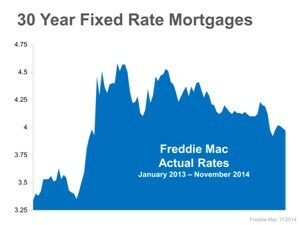 We expect this trend will reverse direction and rates will slowly increase well into 2015. At the beginning of the year, it is likely that buyers will see more favorable rates than those at the end, with no sudden spikes anticipated. • First-time homebuyers: This segment of the population has dominated the conversation for at least the past year and will no doubt continue to do so in 2015. Many obstacles — from tighter loan restrictions and higher down payment requirements to student loan burdens and lack of available, affordable homes — prevented first time buyers from entering the market in 2014. The National Association of Realtors reported that first-time buyers currently comprise only 33 percent of buyers. That represents their lowest market share since 1987, when first-time buyers made up only 30 percent of the market, largely because mortgage interest rates were double what they are now. But there is some great news. The recent announcements of new 3 percent down payment programs by Fannie Mae and Freddie Mac should put purchasing a house within the reach of more buyers, especially those who have good credit and steady employment but have not been able to save enough for a 10 percent or 20 percent down payment. With these new programs, we’re optimistic that 2015 will be noticeably easier on many first-time homebuyers. • Neighborhoods to watch: The big question on everyone’s mind is where the growth will be in the coming year. Downtown and areas convenient to Metro are surely on the radar. More specifically, data from MRIS subsidiary RealEstate Business Intelligence identifies Brookland, east of Capitol Hill and the H Street Corridor as three of the places to keep an eye on. All three locations are seeing more activity and asking prices are edging upward at a faster rate. There is also an undeniable buzz about these neighborhoods coming from real estate agents. Our data suggests each of these locales will see an uptick in market activity for 2015.